Taking vitamin D during pregnancy may strengthen the bones of babies born in the winter months, a study has found. 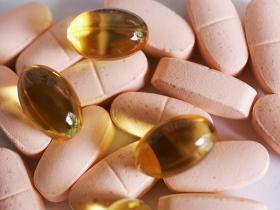 The supplements are thought to counteract the seasonal drop in vitamin D levels caused by lack of sunlight. Bone growth in the womb and during early infancy is linked to overall bone strength later in life. Weaker childhood bones may predispose an individual to conditions such as osteoporosis in older age, say experts. Current UK government guidelines recommend that all pregnant women take daily supplements of 10 micrograms of vitamin D to improve their babies’ bone health. For the new study scientists recruited 1,134 women from Southampton, Oxford and Sheffield who were between 14 and 17 weeks pregnant, and had low to normal levels of vitamin D.
Half took a 25 microgram vitamin D capsule daily while the other half were given inactive placebo pills. Overall, the researchers found no significant difference in bone mass between the babies born to each group of mothers. But further analysis showed that babies born during the winter months benefited if their mothers took vitamin D supplements while pregnant. Their bone mass was higher than that of winter-born babies whose mothers received the placebo. Co-author Professor Nicholas Harvey, from the Medical Research Council Lifecourse Epidemiology Unit at the University of Southampton, said: “Babies’ bones strengthen during the last stages of pregnancy. Since sunlight is our most important source of vitamin D, mothers’ levels of vitamin D tend to drop from summer to winter, and babies born in the winter months tend to have lower bone density than those born during the summer. The research is reported in the journal The Lancet Diabetes and Endocrinology.